Of plans to sell the machine, he said: "Many commercial schemes have been considered and proposed that may surface in 2008 or beyond, one of which is 'buy 2 and get 1'." The laptop has been developed to be as low cost, durable and as simple to use as possible. The XO's software has been designed to work specifically in an educational context. It has built-in wireless networking and video conferencing so that groups of children can work together. [The industry] should look to connect the next five and a half billion. The project is also working to ensure that children using the laptop around the world can be in contact. "I'd like to make sure that kids all around the world start to communicate. It will be a very interesting experiment to see what will happen when we deploy a million laptops in Brazil and a million laptops in Namibia." 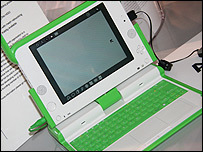 The OLPC project is working with Google who will act as "the glue to bind all these kids together". Google will also help the children publish their work on the internet so that the world can observe the "fruits of their labour", said Mr Bletsas. He said that the hope was to put the machine on sale to the general public "sometime next year". "How to do that efficiently without adding to the cost is difficult," he said. "We're discussing it with our partner eBay. We need to minimise supply chain cost , which is pretty high in the western world." Mr Bletsas said that a philanthropic organisation would be formed to organise the orders and delivery of the laptops. "It's much more difficult to do this than making the laptop," he said. The aim is to connect the buyer of the laptop with the child in the developing world who receives the machine. "They will get the e-mail address of the kid in the developing world that they have, in effect, sponsored." Mr Bletsas was speaking amidst the festival of consumerism taking place on the show floor of CES. He said he hoped that the laptop project would help children enrich their lives to the extent that one day they could become consumers of the types of technologies on display in Las Vegas. But he castigated the industry for being unambitious in its plan to "connect the next billion people". "They should look to connect the next five and a half billion. "The way to do it is not to try and deploy tried and trusted technology but to try and develop technology specifically targeted to the developing world." 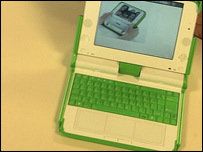 He said that OLPC was ensuring that laptops were being deployed to areas where there was internet access. "We are trying to help the governments - that ranges from donating resources, to making sure that we work with them and that they don't consider the laptop as something that can work in a disconnected environment. "It's vitally important that children are connected. My ambition is that we will get them connect to a vast amount of information that is unavailable to them. "It will stimulate their interest in looking further - not waiting for some teacher or an adult."